Very nice. Not just the actual equipment but the workmanship on the component rack/cabinet is wonderful. With all those components, and issue with heat and ventilation? May I ask where you bought the cabinet, it's very nice and may consider something like that myself in the future? It's made by salamander designs. Model is Corsica. Heat is the issue. It has ventilation grill on the bottom and some of the shelves. I used selves with ventilation grills on components that need more air. I used a standard shelf(no vent) on the above shelf to force hot air in the back. There were panels for the back with some ventilation holes. I kept the panels off so more air can vent out. This also allowed me to fit all cables. You can imagine back side is a mess. Multiple wires coming from each component and they are all low gauge upgraded cables. Salamander designs offer dual 12mm fan kit for back panels, they are temperature controlled. But I needed the panels of for cable management. So far no trouble. I posted pictures of my rear cabinet earlier. This is the front cabinet with speakers and the monitor. Martin Logan Descent i - with 3x10" subs(250w RMS amp for each) on each side. Martin Logan Theos - left and right towers with 44" tall electrostatic panel and 8" passive driver. Martin Logan Stage x - center at 30" wide with 2x6.5" passive drivers and electrostatic mid-range panel. Pro-Ject audio - RPM 9.2 Evolution turntable with Sumiko Blue point evolution cartridge. Oppo BDP-105 Universal Disc player(BD/DVD/CD/SACD/DVD-A) with ESS sabre 32 dacs. Pro-Ject audio - RPM 9.2 Evolution with Sumiko Blue Point Evolution cartridge. Audioquest Columbia interconnects. McIntosh MC207 power amp. nearly 100lbs beast. This is the rear cabinet pic. Mighty HLD-X0 sits on upper right side feed into Crystalio II video processor. Notice empty space below JVC VCR on Left side. I am awaiting Sony MSC-4000 muse decoder from Japan. The MUSE looks nice and nice rack. I replaced the TiVo premiere XL4 cable DVR(4tunes w/2TB) with the new TiVo Roamio Pro (6tuner w/3TB) cable DVR. I can call this DVR the best DVR ever made. Premiere XL4 was very good but it wasn't responsive enough on streaming services like Netflix, YouTube etc.. The new Roamio DVR is super fast. all apps takes 1-2 seconds to start. GUI is extremely responsive/snappy. wow, i'm amazed, substance. mine is laughable. Thank you for sharing with us your pride and joy, the results of your hard earned labors. All things take time and never forget that it's a hobby......meaning the journey never ends, and that it's the enjoying the fruits along the way. Magnepan MG 20.1 Cherrywood and Black. Custom stands are very thick steel with cement and epoxy filling and coated with rubber. Crossover capacitors (35) replaced with Z capacitor (eliminating all 35 connections with point to point Jenna labs wire with cardas silver solder in the entire circuit). Fuses directly bypassed. Speaker stands on custom speaker feet marble stands. Shunyata Research Inc. Powersnakes (x2), Venon PowerCable replacement powercords. The room is approximately 24 x 23 feet with vaulted ceilings and approximately 150 12"x12" sound proofing panels and additional corner base traps to minimize perpendicular surfaces and distortion. A few weeks ago, I got a used receiver, a Sony STR-DA2ES. I bought it off E-bay to replace my STR-DE935. The DA2ES has a number of features that my DE935 lacks: 2 multichannel inputs (one 5.1 and the other 6.1), all main speaker terminals are banana plugs, 3 assignable digital audio inputs, 2 component inputs with switching to 1 component output, 6.1 preamp outputs (I am not sure what they are used for), an on screen display, and a much better remote control. One feature the DA2ES has, which I find interesting, is the volume control. Its display shows the volume in decibells (dBs), Normal listening level seems to be from --55 to -45 dBs. I chose the DA2ES instead of a newer receiver as I need the controi-s jacks it has. Right now, I have a Sony 200 DVD changer in a closet in my living room. The control-s cabling goes from my current amp to the changer which is a distance of about 20 feet. I can aim the changer's remote control at the DE935 and control the changer with the closet door closed. (There is no need for an IR repeater). 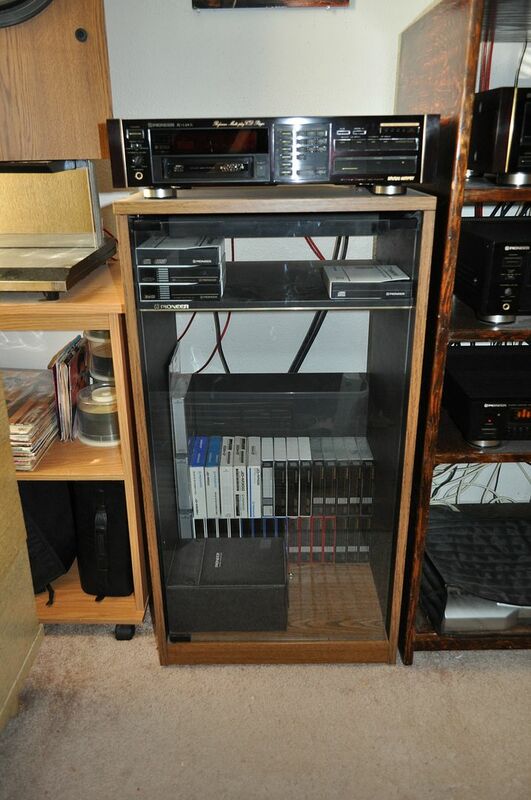 I am going to add a Sony VCR with the control-s jacks so the VCR can be placed in the closet too. Does anyone else have a STR-DA2ES and what do you think of it? I'm in awe of some of the setups I've seen here. Mine is a LOT more modest; I live in a smallish flat and the walls and floor are less soundproof than I would like, so it's a pretty simple surround sound arrangement. Originally I had the TV and some of the equipment standing diagonally in the corner of the room, taking up a big chunk of floor space - the new setup has let me put it all against the wall and under shelves, which has freed most of that space. I put off doing this for nearly 10 years because I thought I might want to use the fireplace, which wouldn't be good for the TV, but I've finally decided it's probably never going to happen - central heating works well enough for me. At the same time the fireplace is early Victorian and one of the nicest features of the flat, I didn't want to cover it by putting the TV in front of it. 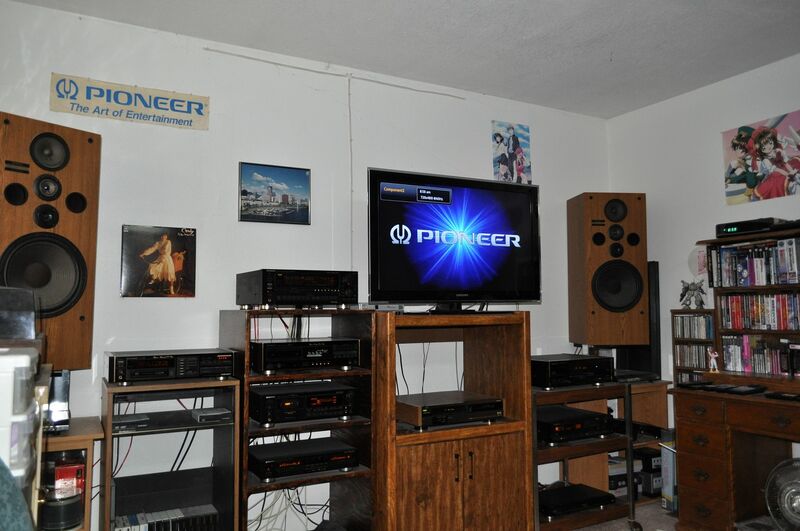 1 - My "new" laserdisc player, a Pioneer CLD-950. Single sided play, but seems to be solidly built and plays PAL and NTSC so I'm reasonably happy. No analogue sound on PAL is the main disadvantage. 2 - Digital TV receiver and HD recorder. 3 - A cheapo upscaling DVD player connected to the HDMI input, and to the coaxial digital socket on the amp. Region hacked. I may eventually replace this with a blu-ray player if I can find one that can be region hacked for DVDs. 4 - DVD/HD recorder. The laserdisc player and video and digital receiver feed into this, with output to the TV. Connected to the optical digital socket on the amp. Region hacked. 5 - Android internet TV thing and media player - connects to BBC iplayer, YouTube etc, linked to TV via HDMI. If I eventually get a blu-ray player it will probably have this capability, and I'll move the android box to another room. 7 - VCR / DVD combo. I don't actually own any videotapes at present, but occasionally it's useful to be able to play them. I bought this cheap, not really needing the DVD player, but at some point it may turn out to be useful. Region hacked, but for some reason shows NTSC in black and white - possibly just a cable problem. 8 - SCART switch - also called Euroconnector, this is a big clunky analogue RGB & sound connector, used by most of my older kit. 10 - Sony STR DEA475 amp; Surround sound, receiver, etc. 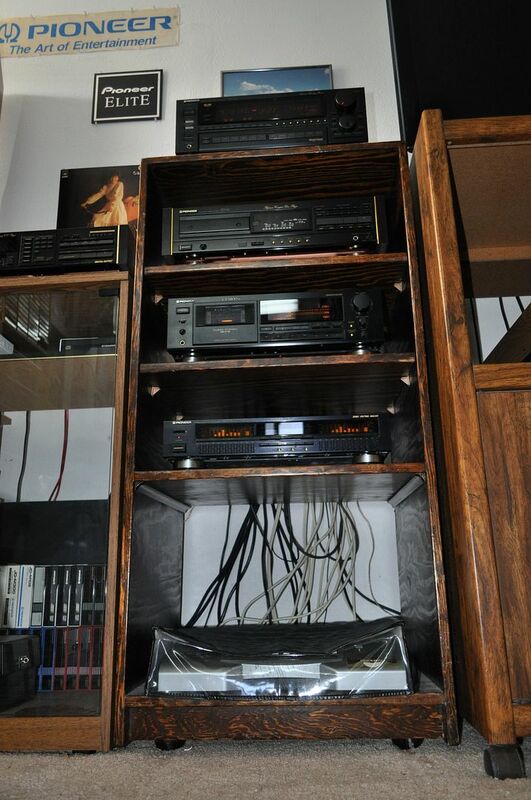 11 - Speakers - A fairly ordinary home cinema setup, there are also surround speakers on the wall, not shown in the photo. The smaller speakers at the top to each side of the chimney aren't part of it, they're for my music setup - that's separate from the home cinema setup, with speakers in two rooms. 12 - The TV is a 40" Teco LCD - it's a bit old now, 1366 x 768 resolution, with a load of inputs for video, computer, HDMI etc., and can handle NTSC as well as PAL. Sooner or later I'll probably replace it with a modern LED design. On the whole this is working well - the TV is a little higher off the floor than I would prefer, but not so badly I strain my neck - it just makes it difficult to do anything else while watching TV. update 22/1/14 - I've just ordered a Sony BDP-S1100 blu-ray player which will hopefully replace the upscaling DVD player (which is getting a little noisy) and the network media player box. I've gone with this one because someone is selling them region free (for DVD) at a reasonable price on eBay UK. Last edited by ffutures on 22 Jan 2014, 11:49, edited 1 time in total. I have just been reading and looking at the photo's of your system sir. It's always interesting to read about each individuals AV journey, the changes that have taken a long time & many years. What I have discerned from what you have written, is that you have enjoyed your journey along each step of the way. We also have our lives to live, as well as the purchases that we make ect. Your home is your home and by what you have written it is clear to me personally, that you love your home. I for one am appreciative of what you have shared with us, and have drawn comfort and can equally relate to the love that I have for my home. It was a genuine pleasure to read. I've just added a Sony BDP-S1100 blu-ray player, taking the place of an upscaling DVD player which was getting a bit noisy and a network box for iPlayer and other online video sources. Someone has them region-hacked (for DVD) on eBay UK for £44.99 ($74.75), which seemed a pretty good deal. As usual the main problem with all of this was getting all the cables to work properly. Most of my older equipment uses SCART connections, which are an excellent idea in theory, bi-directional with stereo sound and RGB or composite graphics, but implemented by designers who somehow came up with the world's ugliest and least reliable connector, which comes out of its socket very easily. Since SCART sound can be a bit iffy I've got extra audio cables - digital or analogue sound - and that means there's always a tangled mess. It took more than two hours to pull everything I'm disconnecting, untangle the mains leads and cables, and get everything back in place and working. Then I finally tried the player. I was a bit worried when the first thing it did was check for updates and insist on updating the firmware, but this didn't affect the region coding - I could still play UK and US DVDs without problems. It's possible that the next update will mess things up, of course! So far my reaction is pretty favourable, not least because this let me eliminate several cables and an HDMI switch box. Video quality is very good with blu-ray (but I only own one disk so it's possible I've been lucky) and as good as I'd expect with upscaled DVD, and the media player part of it works very well, with nice clear menu options throughout. Sound is OK, but doesn't seem any better than the previous player. One oddity - it didn't seem to recognise DVDs with 4:3 format video and switch the TV to that format automatically, it's possible I need to tweak the settings. One other change I made was the cabling for a PC I sometimes use on this screen. Originally I had it connected via an HDMI cable because I was getting a lot of ghosting with a long VGA cable. But I wanted to eliminate the HDMI switch if possible. It happens that a long time ago I wanted to use the TV in another room as a second screen for my main computer. Since that was a long cable run, about 25ft if I went around walls and kept things tidy, and VGA cables that long are horribly expensive if they're any good, I ended up buying a simple VGA over CAT6 cable setup - two plug adapters and a length of cable, costing about five pounds for the plugs and four for the cable. This never got used because Windows XP didn't let me set it up the way I wanted, but the cable worked very well indeed. So today I found the plugs and a suitable CAT6 cable, this time about 3 metres, and tried that. The results were perfect - no ghosting at all - and I can thoroughly recommend this as a better alternative to conventional VGA cables over 5ft or so, it's cheaper and a smaller lighter cable, and works really well.